The story of WALDSONNE began in 2003 when four members of the Moscow-based dark-folk band NEUTRAL “saw the sunlight streaming through the black depths of the forest” and made their mind to play warm and light-colored songs while remaining in the neo-folk trend. LANGUOR was born that year. In 2004, the song “The Purpose Wells” was included to the Shadowplay Records 2CD-release naturally entitled “Colours of Black: Russian dark scene compilation”. 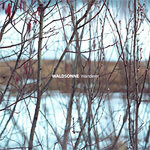 Designating their distance from the dark-scene, the ensemble changed their name to WALDSONNE and start recording material for their debut album. Veronika Martynova (voice, Irish harp), Iliya Lipkin (mandolin, acoustic guitar), Petr Sviridov (acoustic guitar), and Anna-Noel Buzuk (violin) strive to merge into natural forces and express themselves in live-acoustic instrumentation and natural singing. You’re welcome to hear and contact the band through WALDSONNE official site or MyspaceMusic page. "It’s truly a gift from the heavens, and it’s all I expected it to be. The disc contains eleven warm and cozy, plucked folk songs about the glory of nature, the power of the sun and the magic that surrounds us every day, magic that we’re not always taking heed the way we should. There is constantly something meditative over the tunes, something calm and reflective. And I must disagree with the statement on R.A.I.G’s website, saying that Waldsonne’s music is not about melancholy; this is rather VERY melancholic but in a creative and comfortable way, like how you can feel when autumn arrives and the leaves are falling of their branches, the forests change to their brown dresses and it’s getting colder and colder… If you like your pagan folk female fronted, this could very well be your new favorite album. It should also appeal fans of ethereal and 'heavenly voices' folk." – by Markus Eriksson of The Shadows Commence (Sweden) (October 2008). The album was also reviewed at: Alternativmusik.de (Germany), MADZ-zine (Russia), Seidr (Russia), Obliveon (Germany), Heathen Harvest (USA), Gothtronic (The Netherlands), Rock Impressions (Italy), Chain D.L.K. 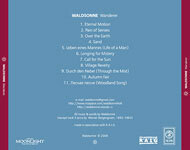 (Italy), Obliveon's interview with WALDSONNE (Germany), Radiodrone (Russia).